And yet, it’s getting lots of buzz online. 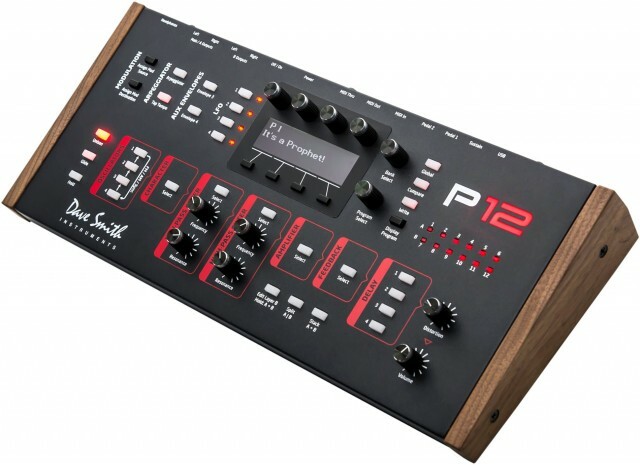 I was thinking for a bit about why that was, and eventually arrived at this solution: for synth lovers, the Prophet 12 module is about the most perfect way imaginable right now to spend two grand. It’s also a triumph of making a module that works without the maker feeling obligated to stick a keyboard on. And the module seems sensibly laid out. I’m generally a fan of having as many dedicated knobs onboard as possible, particularly when shelling out for hardware. But the P12 seems to be a smart compromise. Encoders do require some push-button switching, yes, but the switches are laid out in a smart, logical way. The connection between the buttons and the encoders is intuitive, and they’re grouped in a way that means you should be able to adjust sound parameters quickly. Signal flow is smack-you-in-the-face clear. And most importantly (cough, Slim Phatty), you get dedicated filter knobs, so switching modes of the encoders doesn’t mean you have to lose access to filter cutoff. In fact, if I had two grand to spend on an outboard synth, it’s hard to imagine anything right now competing with this. Actually… scratch that. I’d save the extra cash and get the keyboard. It’s a complete instrument, and having dedicated knobs is still better – so much better that the backpack compatibility of this still can’t make it compete. But this is the second-best polyphonic analog gear out there right now. And it’s a beautiful second place, well worth the silver medal and a spot on the podium and some tears. So, maybe that’s the news. All images courtesy DSI. Click either to embiggen.